^ 2.0 2.1 2.2 Watson, Bruce. Sacco and Vanzetti: The Men, the Murders, and the Judgment of Mankind. New York: Viking Press. 2007. ISBN 978-0-670-06353-6 （英语）. ^ 3.0 3.1 3.2 3.3 3.4 Avrich, Paul. Anarchist Voices: An Oral History of Anarchism in America. Princeton, NJ: Princeton University Press. 1996: 132-133 （英语）. ^ Havoc Wrought in Morgan Offices. New York Times. 1920-09-17 [2010-02-04]. （原始内容存档于2011-06-04） （英语）. ^ Funds are Needed in Fight on Reds. New York Times. 1920-09-19 [2010-02-04]. （原始内容存档于2011-06-04） （英语）. ^ Gage, Beverly. 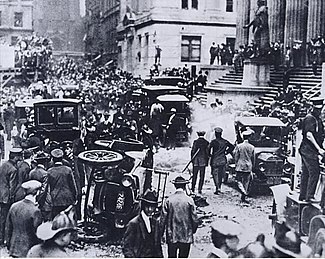 The First Wall Street Bomb. History News Service. [2010-09-16] （英语）. ^ Explosives Stores All Accounted For. New York Times. 1920-09-17 [2010-02-04]. （原始内容存档于2011-06-04） （英语）. ^ Bryk, William. WALL STREET'S UNSOLVED BOMBING MYSTERY. New York Press. 2001-03-06 [2011-12-25] （英语）. ^ Bellows, Alan. Terror on Wall Street. DamnInteresting.com. 2007-05-14 [2011-12-25] （英语）. ^ 10.0 10.1 10.2 10.3 Avrich, Paul. Sacco and Vanzetti: The Anarchist Background. 1991: 213,227. ISBN 978-0-691-02604-6 （英语）. ^ Newby, Richard. Kill Now, Talk Forever: Debating Sacco and Vanzetti. AuthorHouse. 2011: 590. ISBN 978-0-7596-0792-7 （英语）. ^ 12.0 12.1 Dell’Arti, Giorgio. La Storia di Mario Buda (pdf). Io Donna. 2002-01-26 （意大利语）. ^ Milwaukee Police Department Officer Memorial Page. from the City of Milwaukee website. （原始内容存档于2009-02-20） （英语）. ^ Balousek, Marv; Kirsh, J. Allen. 50 Wisconsin Crimes of the Century. Badger Books Inc. 1997: 113. ISBN 978-1-878569-47-9 （英语）. The 1917 bomb used black powder with a homemade sulfuric acid/metal plate "time" fuse, which failed to explode until the package was opened at the police station. By 1920, it is notable that Galleanist bombmaker(s) had apparently discontinued the use of the unreliable acid detonators in favor of dynamite with an electric blasting cap and a clock wired to a battery as a timed detonator.